It's always so interesting to me how other countries treat Remembrance Day (Veteran's Day or Memorial Day in the US) because I don't think we in America give it much attention at all. It's not a day we get off of work or school, it's not a day of parades or anything. I think it's because we weren't nearly as affected as anyone else by WWI, but it is sad. 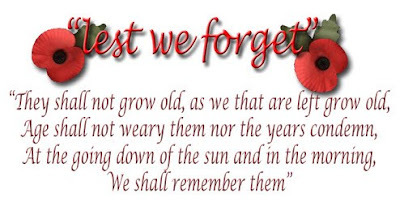 I think, no matter what, people should take time to respect and remember. I got my poppy! I love that we celebrate rememberance day. My nephew is in training for the army so this year was extra special. I watched the memorial service yesterday in Fort Hood. How horribly sad. If I had today off I would go to the local veterans parade they are having here in town.